Description: Caress your taste buds with the sweet strawberry bliss that BESST Joy offers! Our new generation of drinks has no artificial additives, is low on calories and uses stevia. Our drinks have natural herbal extracts that were obtained using а special extracting technology that keeps their bioactive properties. 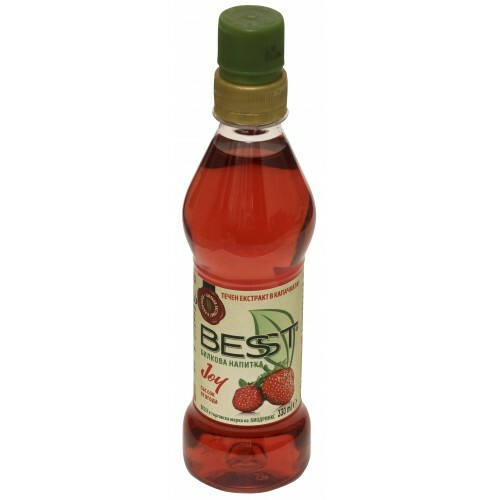 Just open the upper cap, shake very well and enjoy some yummy and healthy strawberry juice. Feel the Joy! Contents: Strawberry juice, Nettle (Urtica Dioica), Salvia (Salvia Divinorum), Verbena (Verbena Officinalis), Raspberry leaves. Sweetened with stevia.